That was one delegate’s comment on the Catch Up conference ‘Overcoming disadvantage for struggling learners’ held at the NEC in Birmingham on 2nd April 2014. The conference brought together the movers and shakers from the worlds of educational research and policy. John Dunford kicked off the proceedings with a thought-provoking keynote talk. John is the National Pupil Premium Champion and that’s exactly what he does – he champions the rights of FSM pupils. His message to us was that deprivation must not be an excuse for pupil failure. 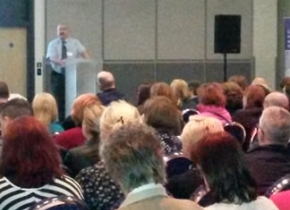 As John told us, ‘In 15% of schools, FSM attainment is above the national average for ALL pupils’. If some can do it, we all can. Robbie Coleman from the Education Endowment Foundation brought us up-to-date on how research by teachers is helping to shape classroom practice. He argued that it is only by having valid and reliable evidence that we can make education ‘politician-proof’! The workshop sessions provided delegates with a more informal way to learn how colleagues are, in very practical ways, ‘overcoming disadvantage’, from using data wisely to making the most of effective feedback in the classroom. So if you’re looking for ‘a super day with excellent advice’ watch this space for info about the next Catch Up® Conference.